Give the gift of art this holiday, by supporting artists here in North Bay to organize events, exhibitions, and workshops for other artists & wider communities! 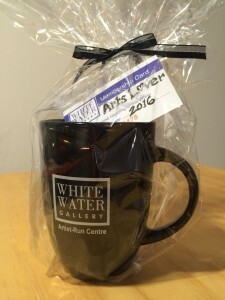 Buy a lover of the arts a 2017 WWG Membership for only $25 here. Or swing by the gallery on the Night Before Christmas (Dec 23, noon-7pm) to pick up a mug, t-shirt, stocking stuffers, or tote bag to wrap your gifts. Or make a $25 – $1,000 donation here. As a charitable organization, this is the kind of gift that gives back to you on your tax return.